Pentax PF-65ED II spotting scopes are a high-quality line of mid-sized scopes with 65-mm objective lenses made with ED glass for optimum resolution. Pentax PF-65ED II scopes come in angled or straight models, and use Pentax’s XF and XW eyepiece series. 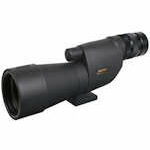 PF-65ED II scopes can be purchased with a standard 20-60x zoom eyepiece or just the body only. Pentax PF-80 ED spotting scopes feature ED glass with rare earth elements for better brightness and resolution. 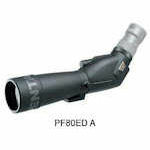 PF-80 ED scopes have lightweight magnesium-alloy bodies, and are completely fog- and waterproof. Pentax PF-80 ED scopes can be purchased with a 20-60x zoom eyepiece, or in body only configuration. All Pentax XF and XW eyepieces will work on PF-80 ED scopes.